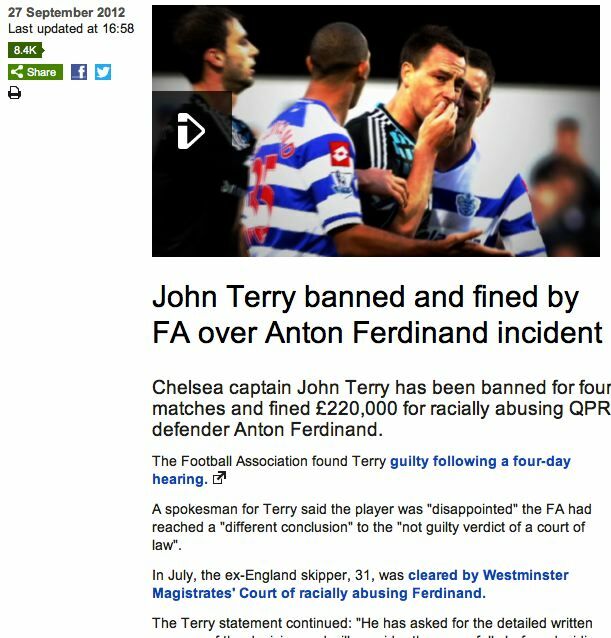 So, John Terry has been found guilty by the English Football Association (FA) for racially abusing Anton Ferdinand. But, having been found guilty, the FA have given him the extraordinarily lenient punishment of a 4 match ban and a fine of £220,000. Given that John Terry apparently earns some £140,000 a week, this amounts to 10 days’ wages. I am astounded and saddened that the FA has been so easy on John Terry. In my opinion, he should have faced a lengthy ban, 8 matches or more. A life ban would have been justified in my opinion, but was never going to happen. Contrast Terry’s punishment with the one given to Luis Suarez last year for using the “n” word against Patrick Evra. Suarez received an 8 match ban. And Joey Barton recently received a 12 match ban for persistent violent behaviour on the football field. What sort of message does this send out about the FA’s commitment to the “kick it out” campaign to rid football of racial abuse? A very weak message I would say. In fact, it leaves the campaign in tatters in the view of many people. I am ashamed to call myself a Chelsea supporter. Chelsea would be, of course, perfectly within their rights to sack John Terry for gross professional misconduct, but that isn’t going to happen. Quite the contrary it would seem, Chelsea have been supportive of their player throughout these proceedings. Terry will undoubtedly receive some offensive chants from opposing fans when Chelsea play their away games, but as he seems to have the skin of a rhinoceros I doubt this will affect him much. The FA really had a chance to take a proper stance against racism within football and within wider society. They have sadly failed to do so with this token punishment. In my first post about the Voyager space craft, I mentioned that I was going to be talking about the Voyager space probes on live TV on Thursday the 27th of September. This has now been shifted to next Thursday, the 4th of October, giving me time to write part 2 of this blog on their incredible journey. In this part I will talk bout the visit of Voyager 1 to Titan, Saturn’s largest moon, and Voyager 2’s visit to Uranus and Neptune. In part 3, which I will post early next week, I will talk about their ongoing journey beyond our Solar System. When Pioneer 11 flew by Saturn in 1979 it detected that Titan, Saturn’s largest moon, had a thick, gaseous atmosphere. Titan was discovered by the Dutch astronomer Christiaan Hyugens in 1655, and had long held fascination for planetary scientists. That Titan may have an atmosphere was first suggested by Josep Comas Solà in 1903. This was confirmed by Gerard Kuiper in 1944. It was decided by NASA’s Jet Propulsion Laboratory to alter the course of Voyager 1 to go and study Titan in more detail by flying close to it. 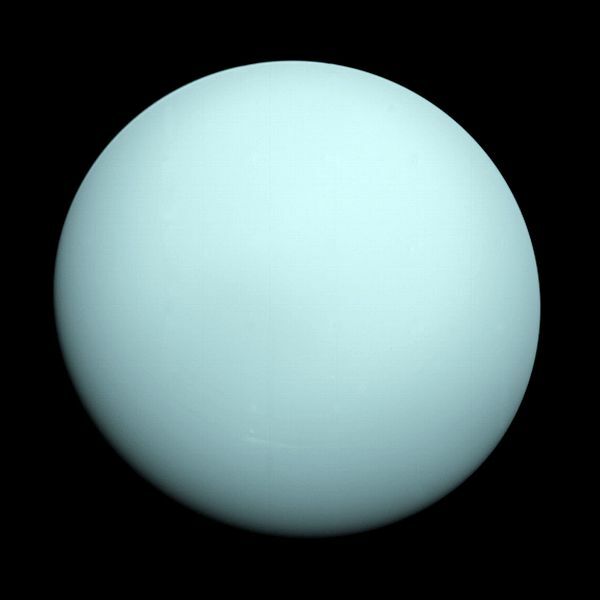 This effectively meant that it would not be able to continue on to visit Uranus and Neptune, as had originally been planned. The pictures Voyager 1 took of Titan have proved vital to our understanding of this planet sized moon. 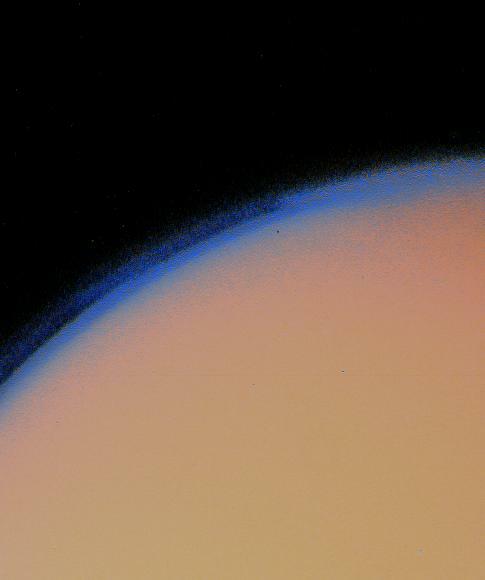 This next picture shows the haze that Voyager 1 was able to see in Titan’s atmosphere. The close fly-by of Voyager 1 also showed that Titan’s thick atmosphere is impenetrable at visible wavelengths, so Voyager 1’s cameras were not able to see any surface detail. Voyager 1 was able to determine that the atmospheric pressure at the surface of Titan was about 1.5 times the atmospheric pressure at the surface of the Earth. With Voyager 1’s close fly-by of Titan taking it out of the plane of the Solar System, it was left to Voyager 2 to continue the grand tour on to Uranus and Neptune. Voyager 2 flew by Uranus in January 1986. 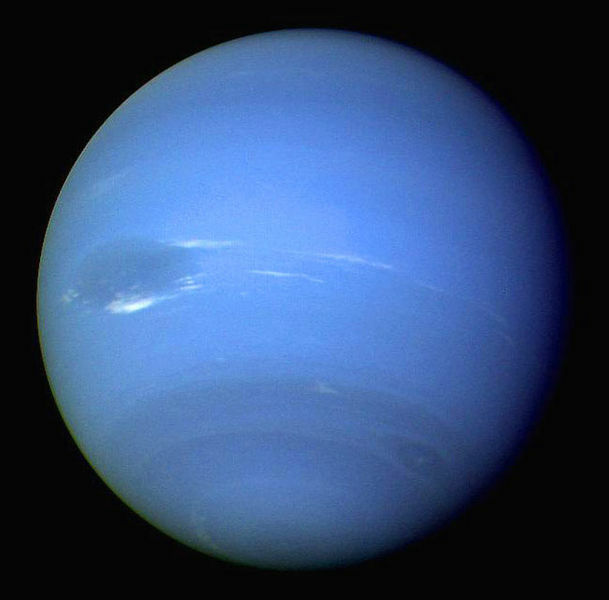 For both Uranus and Neptune, the images taken by Voyager 2 are still the most detailed we have of these “ice giants”. Voyager 2 discovered several new moons orbiting Uranus, and was able to study its planet’s atmosphere in more detail than before. 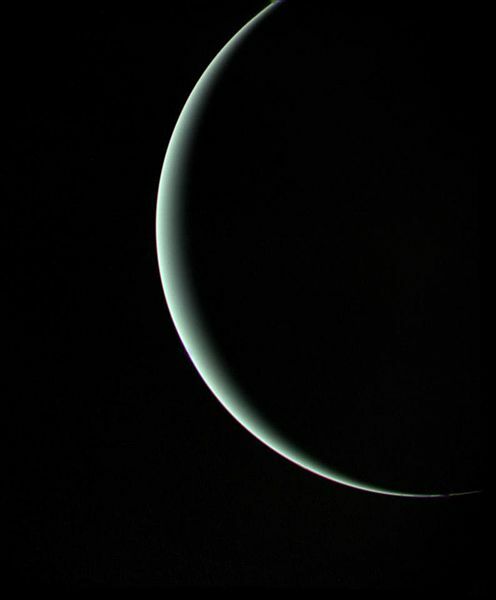 A crescent Uranus, taken as Voyager 2 looked back towards Uranus as it heads off towards Neptune. 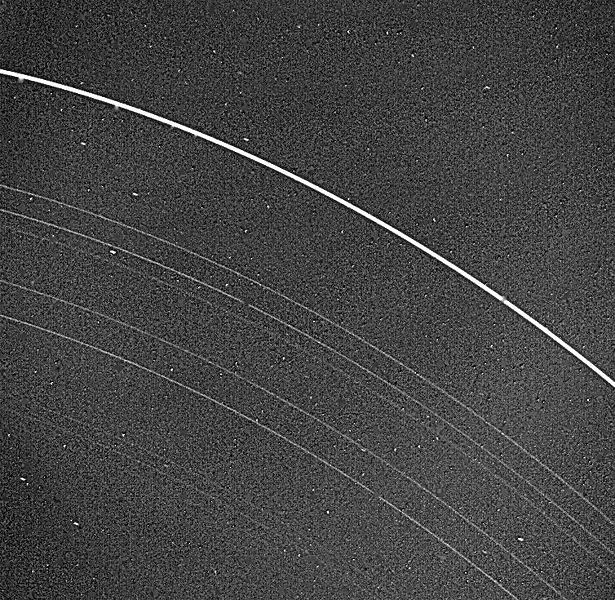 Voyager 2 also studied the rings of Uranus. These were first discovered in 1977 by the Kuiper Airborne Observatory, during an occultation. Voyager 2 finally arrived at Neptune in August 1989. Very little was known about this planet prior to Voyager 2’s visit. 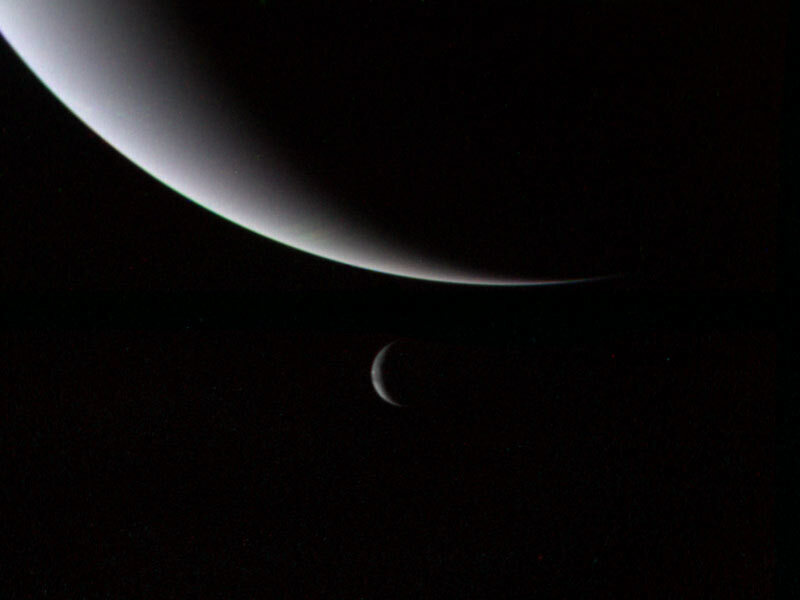 Voyager 2 also took an image of Neptune and its largest moon Triton as it continued on its journey to the outer reaches of the Solar System. Part 1 of this post is here, and part 3 is here. Today (Wednesday the 26th of September) is a big day for students of Coleg Morgannwg, where I have recently become head of Physics. 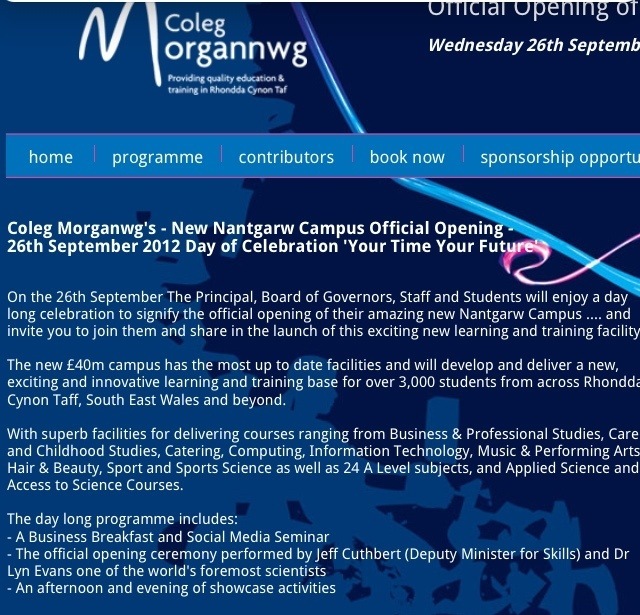 It is the official opening of the brand new building that has been built in Nantgarw. To mark the occasion, the College has invited Dr. Lyn Evans, who is lead scientist of the Large Hadron Collider at CERN, to be part of the opening. Dr. Evans, known by the press as “Evans the atom“, grew up in Aberdare, which is up the valley from Nantgarw. He studied Physics at Swansea University, and then went on to also study for his PhD at Swansea. 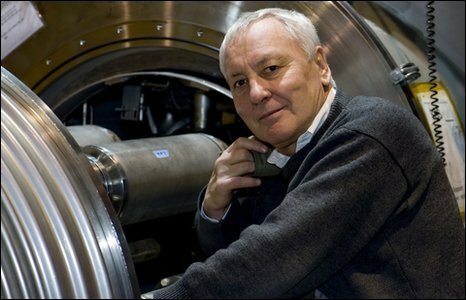 He has gone on to work at CERN and become leader of the Large Hadron Collider, the biggest and most expensive scientific experiment ever built. Coleg Morgannwg primarily serves the Rhondda Cynon Taf area of South Wales, an area which has seen huge social deprivation since the collapse of the mining industry in the 1980s. I only hope that the students who get to see and meet Dr. Evans today will be inspired to work hard and achieve their goals, as he is testimony that, with a good education, anything is possible for the young people of the South Wales valleys. I was lucky enough to be at Live Aid, an extraordinary day in July 1985 that I will never forget. Of the many bands who performed that day, the two who stood out for me were Queen and U2. At the time, U2 were not a particularly well-known band. Their 4th album Unforgettable Fire had been released in October 1984, and was very much their breakthrough album. It had Pride (In The Name of Love) as its big hit. So, by the time of Live Aid I, and probably quite a few others there, knew of them and had maybe even gone back to listen to their first three albums, Boy, October and War. 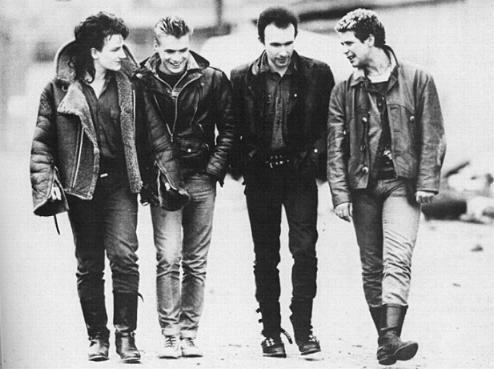 The Irish band U2, in their early days in the mid 1980s. At Live Aid they played several songs, but the one which stole the show for me was Bad. The version they played at Live Aid lasted for over 10 minutes, and included Bono leaping down from the stage and inviting a female member of the crowd to join him for a few seconds of a tender dance. It stole the show in my opinion. Here is the Live Aid performance in its entirety. Enjoy! What is your favourite U2 song? About this time of year, presumably because we are at the Autumn Equinox, photographs of analemmae seem to pop up a lot on the internet and on FaceBook. I showed an example of an analemma to one of my Physics classes last week, and found that they were unable to explain what it shows. So, I figured there was a need for a clear explanation of what a solar analemma shows. 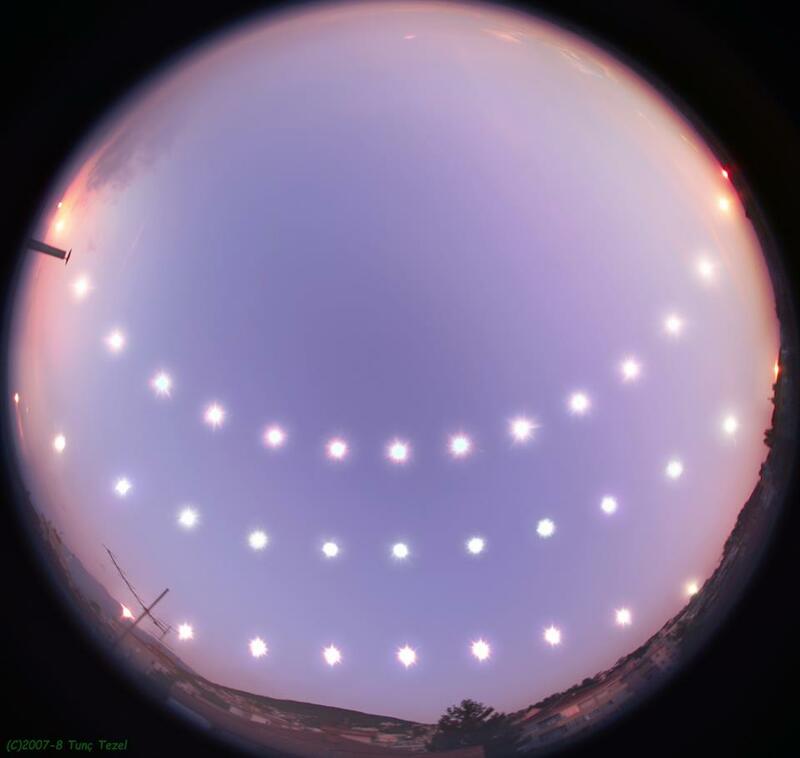 A solar analemma is a photograph taken at the same time each day from the same place, showing where the Sun is in the sky at that same time each day. If one were to take a photo at midday each day, then one would get an analemma that looks like this (bear in mind that one would not adjust when the clocks go forward. So, when they do, one would take the photograph at e.g. 13:00 instead of 12:00 as 12:00 is the real, Solar time). 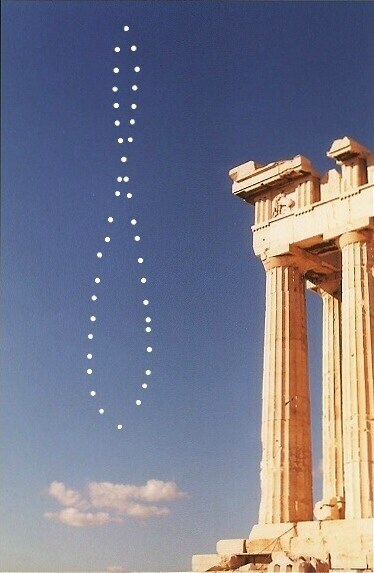 An analemma taken when it is local noon, hence the “figure 8” is vertical. This analemma must have been taken in the Northern Hemisphere at a latitude between the Tropic of Cancer and the Arctic Circle. This is the easiest type of analemma to understand, so I will start by explaining this one before we move on to more complex ones. The “figure of 8” you can see in the photograph above is due to two effects. The first is one everyone is familiar with, the changing height of the Sun in the sky in the middle of the day depending on whether it is summer, autumn, winter or spring. The Sun will reach its highest point in the sky at midday in the Summer, but at the same time in the Winter the Sun will be much lower in the sky. This explains the vertical change in the analemma. On the Spring (or Autumn) Equinox, the Sun at midday is overhead as seen by someone on the Equator. By the time of the Summer Solstice, it will have moved to be overhead at midday for someone at the Tropic of Cancer. On the Winter Solstice, it will be overhead for someone in the Southern Hemisphere on the Tropic of Capricorn. This wonderful picture (taken from here) shows the path of the Sun on the Winter Solstice, the Spring Equinox and the Summer Solstice as seen from Bursa, Turkey. But, what about the horizontal change? Why is the Sun sometimes to the left of the vertical midpoint, and why is it sometimes to the right? This is more difficult to explain. It involves something called the Equation of Time, and I will explain it in part 2 of this blog. 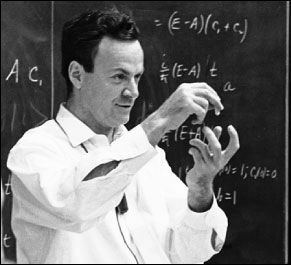 I have just spent the last week showing my Physics students the wonderful BBC Horizon interview with Richard Feynman “The Pleasure Of Finding Things Out”. I vividly remember seeing this interview myself when I was 17. I already knew I wanted to go into physics, but this interview confirmed what I already knew, that physics was the subject for me. Thankfully for all, the interview is available in its entirety on YouTube. When I introduce the video, I also quote what Brian Clegg says about Feynman in his introduction to the chapter on Quantum Electrodynamics in his book Light Years. 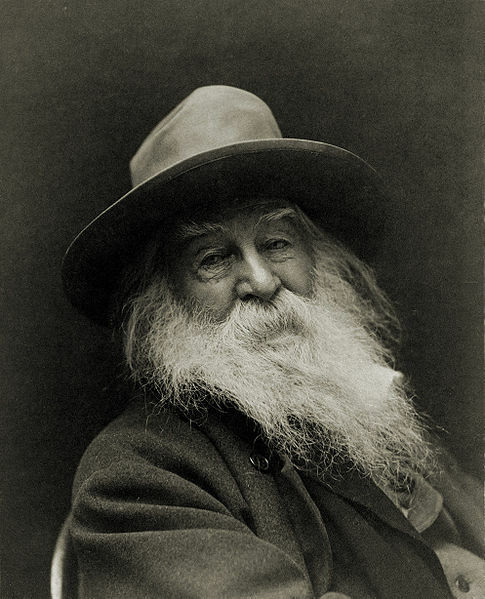 Ask a person in the street to name the two greatest physicists of the twentieth century and they will almost inevitably come up with Einstein. The second name, though, might prove harder to pin down. Ask a physicist to come up with the top two and there will be no hesitation – or at least, if there is any hesitation, it will be over which name to put in first place. The name that ranks alongside Einstein will be that of Richard Feynman. There are two types of genius. Ordinary geniuses do great things, but they leave you room to believe that you could do the same if only you worked hard enough. Then there are magicians, and you can have no idea how they do it. 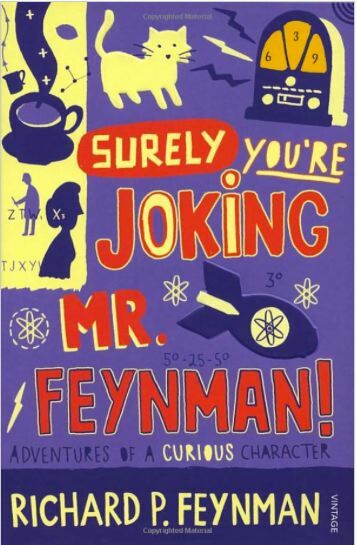 Feynman was a magician.